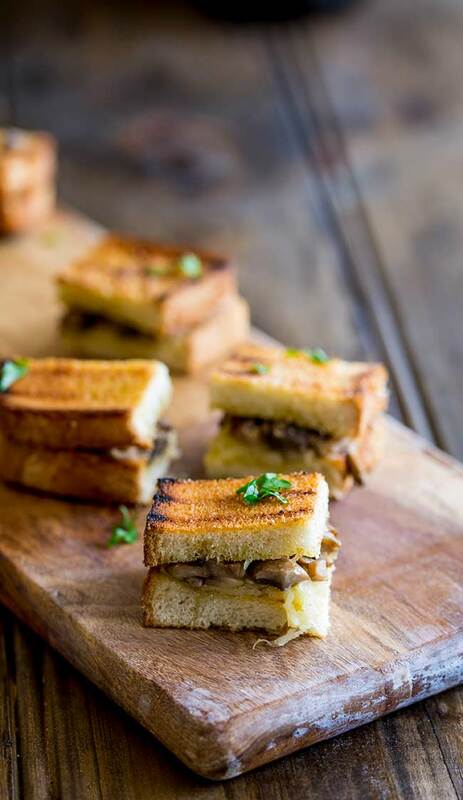 These Gruyere and Mushroom Sandwich Bites are the perfect gourmet finger food. 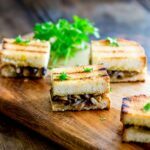 These mini vegetarian party snacks are simple to make and are great for a crowd at parties as everyone loves grilled cheese, and mushroom melts are always a big hit! Or instead of as a finger food, why not try serving them as an easy appetizer. And for the foodies in your life make them fancy with the optional truffle infused olive oil. Now everyone loves grilled cheese, but making them in a fry pan for a crowd can be difficult. Here you can use the oven to make 32 sandwich bites in one go! Fry off mushrooms in butter with a little wine and fresh thyme. Butter one side of the bread and then grill to get some char-lines. Assemble the sandwich: fried mushrooms, grated cheese, plenty of salt and pepper. Place the sandwiches into the oven and cook for 8 minutes until the cheese is just melted and the bread is golden. Cut into mini sandwich bites and serve. Garnish with parsley because it adds freshness and looks pretty. I can’t find gruyere what cheese can I use instead? If you need an alternative for gruyere then you can try using Jarlsberg, or Emmental. For a milder flavor you can pick American Swiss Cheese. For a stronger flavor if it is available Comté would make a great substitute. You want to ensure it is a hard cheese, a soft cheese like mozzarella can ooze and melt into a very wet filling. It is delicious but it makes it almost impossible to cut these into small sandwich bites. And they are much harder to eat as a party snack. Which mushrooms should I use for mushroom grilled cheese? Because the mushrooms are cooked down with butter and seasonings, you can pick any mushroom you like, however avoid using the large portobello mushrooms as they tend to be very wet and will make your sandwiches soggy. For these Gruyere and Mushroom Sandwich Bites I used a mixture of white button mushrooms, crimino mushrooms and a small handful of chanterelles. But most mushrooms will work well here, just be sure to chop them all the same size so they cook in the same length of time. 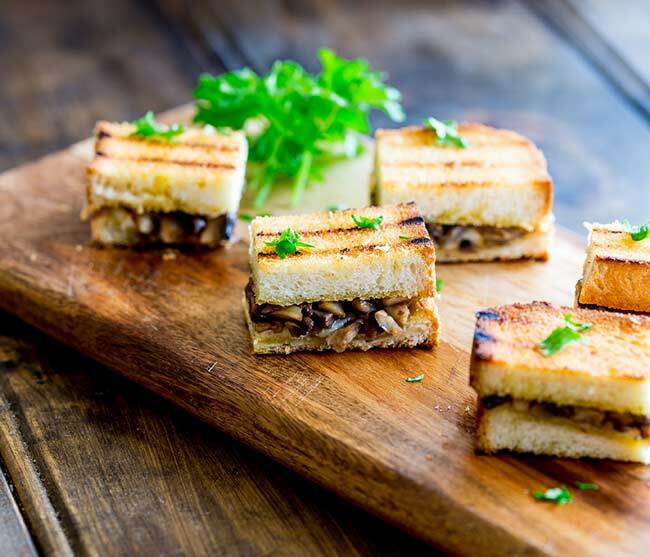 These Gruyere and Mushroom Sandwich Bites are the perfect gourmet finger food. 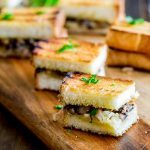 These mini vegetarian party snacks are simple to make and are a great for a crowd at parties as everyone loves grilled cheese, and mushroom melts are always a big hit! Or instead of as a finger food, why not try serving them as an easy appetizer. And for the foodies in your life make them fancy with the optional black truffle infused olive oil. Melt the butter (1/4 stick / 2 tbsp) of butter in a large nonstick skillet. When the butter has melted, add the mushrooms, salt, pepper and fresh thyme. Cook the mushrooms over a medium heat until they have released their juices to the pan. Add in the wine and continue to cook for 5-8 minutes until all the liquid has evaporated and the mushrooms are quite dry. Set the mushrooms to one side. To make the sandwich bites. Pre-heat the oven to 400ºF/200ºC. Melt the remaining butter in a small pan or in a bowl in the microwave. Brush one side of the slices of bread with butter then use a grill pan or griddle to lightly toast the outside. Set the 8 slices of bread out on lined baking sheet, toasted side down. Sprinkle half of the cheese over the 8 slices of bread. Spoon the mushroom mixture over the cheese and then top with the remaining cheese. Place the remaining 8 slices of bread on the sandwiches, toast side up. Bake the sandwiches for 5 minutes then flip and cook for a further 2-3 minutes until the cheese has just melted. Cut each sandwich into 4 squares, arrange on a platter, then drizzle with the truffle oil (if using) and garnish with fresh parsley. 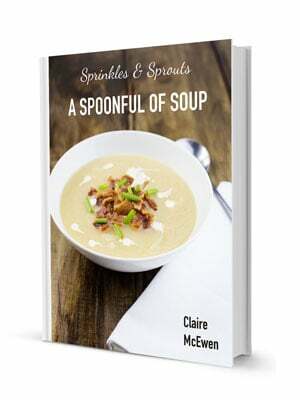 You can use any mushrooms in this recipe, although I would avoid portobello mushrooms as they tend to release too much water. Make sure you chop them all the same size so they cook at the same rate. You can replace the wine with low sodium vegetable broth/stock. But if you do this don't add the salt to the mushrooms until everything has evaporated. Then taste the mixture and add salt accordingly. If you can't find Gruyere then Jarlsberg, Emmental or American Swiss Cheese can be used instead. 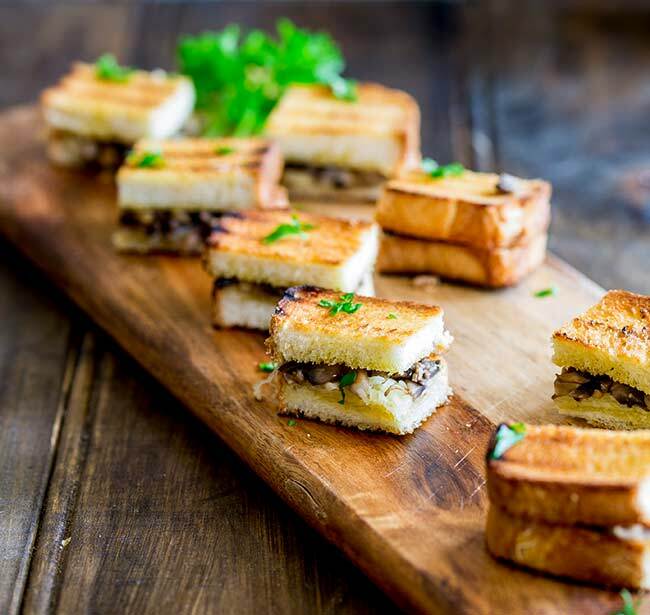 If you love food why not subscribe to my newsletter, I will drop you an email every now and then, just to say hi and send you a couple of recipes I think you might love, like these Gruyere and Mushroom Sandwich Bites. Love the umami of the mushrooms in the sandwich bites. What a great combo! These look amazing! Love the mix of mushrooms and Gruyere! Mushrooms are just the best. This sounds amazing. I seriously want to eat the whole batch myself. So delicious!